Waking up with her heart hammering, Hannah crouched low to avoid detection – from what, she didn’t know. A grainy memory surfaced – drinks with her partner and then the image ends. 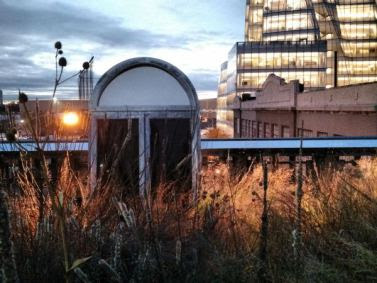 Once beautifully landscaped, the rooftop garden was wild and weedy and a new skyline was illuminated against the sunlit horizon. Shaking her head against the vision, Hannah focused on what she knew. That last drink, a bitter taste, a smile that held contempt. Walking slowly toward the stairway, her hand shook on the doorknob as it turned. Better to brave the unknown than live in fear. Time to move forward. That’s good advice – braving the unknown. I like the flow – towards hope. Thanks, Lily!! I’m glad you read it. I think whatever happened can’t be good… somehow made me thinking of sleeping beauty without the handsome prince. I agree – I think it’s going to be scary, whatever’s out there. Now that’s what I call a cliff-hanger. Excellent build-up. I should have done this with your beautiful picture of cliffs….I’m now watching Broadchurch and enjoying that sense of the familiar. The tension in your piece is consistently palpable. An alcoholic, who can’t remember? A trauma victim? Sci-fi? I like the way you left that to your readers, but delivered all we need to take us somewhere. Nice job, Erin! Thanks, Dawn! Looking forward to seeing you soon! Yes, I’m really looking forward to it as well!